If you are booking your big day you might be thinking about how different types of entertainment might fit the venue and guests you are having. Often the first thing that springs to mind when looking for entertainment for the big day is a wedding singer, this is often a bit of a cliché with weddings and can often make wedding planners blind to some of the other options available. What alternatives are there to your traditional wedding singers? Well one of these is a big band that can provide dancers and a great stage filled experience for any given wedding reception. Whilst hiring a wedding band might be considered a more expensive option, it is clear to see that with the right people it can provide a much more entertaining night with a range of different songs performed with more than one artist. Of course there are many different options when it comes to hiring wedding music for your big day, here are just a few of these options available. 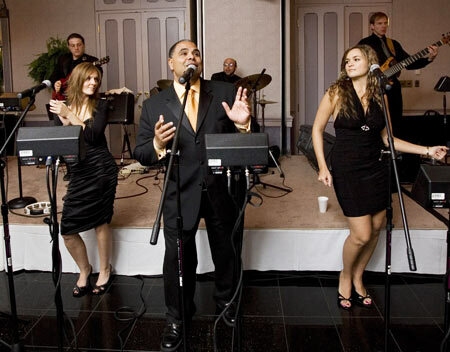 A big soul wedding band can be great if you are looking for a range of different songs in that genre. Looking at wedding bands you can find that they offer something a little different from your traditional singer. You can get some great songs with harmonies that might not work with a lone singer and a backing track. Looking at some of the great motown songs that require a quartet or trio to perform them in all their glory you can see the type of experience this would provide at any given wedding. Often you might want to have a bespoke set list for your wedding, perhaps of songs that mean something to the bride and groom. With this being the case finding a local covers band will be a cheaper option and whilst this might provide the entertainment of a big soul band with fully choreographed performances, the meaning of the songs may make it worthwhile. Covers bands will also often come with instruments and play very little, if anything at all from a backing track. So if you want live music then a covers band would be the option for you on your big day. If your wedding itself is themed, then you might consider a band that fits in with the theme of the wedding. For instance, should you be having a wedding staged in the country or at a luxury farm then a country and western band might be for you. Should you be reading this and your wedding is not themed then do not be concerned, it is very normal for people to theme their weddings, some couples marry at football grounds, zoos and in a number of odd places, wherever you marry you can find a band to suit your venue!